Most weekends in Maine call for a lobster dinner. That might seem like a luxury, but at $5 a pound or less, it’s not that extravagant. We have our favorite source, a guy in a truck who shows up in a nearby parking lot. Year after year, his lobsters are excellent. He sells fish and other shellfish, but the furthest we’ve ventured beyond lobster is steamers. Our lobster guy usually has soft-shell lobsters. You don’t often see these outside of Maine because they do not travel well. A soft-shell lobster is still an American lobster (homarus Americanus), just at a different stage in its life cycle. A lobster’s hard shell doesn’t grow. The way a lobster gets bigger is to form a new shell under the old and then sheds the old one. The lobster will usually eat the old shell, and the calcium will start the strengthening of the new shell. The younger the lobster, the more frequently it molts. Though soft-shell lobsters have a little less meat, but we find them much sweeter. Definitely a treat all summer long. This summer, our habit has been to buy three lobsters, one lobster for each of us for dinner, and an extra for Bella the dog. Actually, that’s a joke. Bella’s lobster gets cooked along with dinner and shelled in anticipation of the next day’s lunch. I start with a simple lobster salad. The knuckles, claws, and tail of one lobster makes enough salad for two generous lobster rolls. The salad needs something crunchy. Usually, I use chopped celery and scallions, but in the early summer, I’ve been known to use radish or fresh raw peas. The tiniest daub of mayonnaise binds it all together. Chopped fresh parsley makes it beautiful. The vehicle to carry the lobster salad to your tummy is an unglamorous top-loading hot dog bun. These buns are native to New England. When I was growing up in Maryland, the only place I ever saw this kind of bun was at Howard Johnson’s (fried clam rolls! ), also native to New England. These are the kind with soft sides and crust only on the top edges. To perfect the sandwich, the outside of the bun is lightly browned in butter. As summer comes to an end, I’m already missing these weekend indulgences! 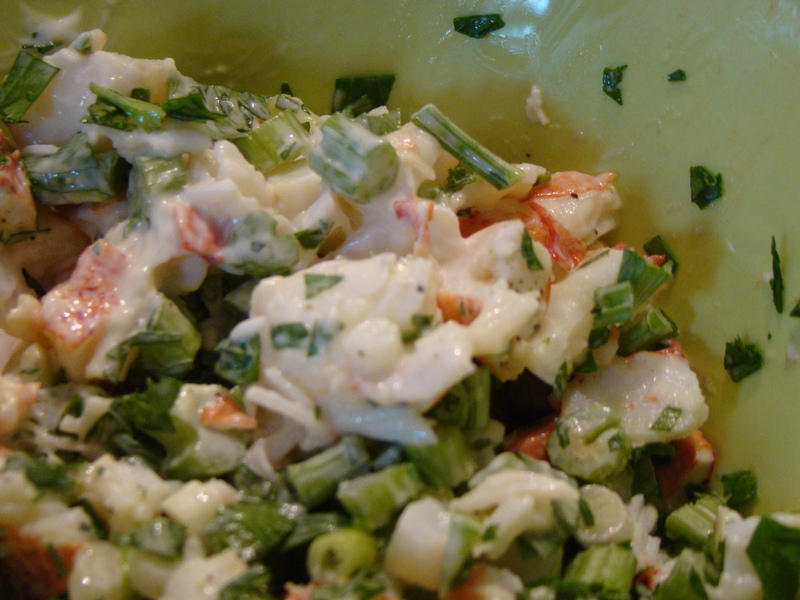 To make the lobster salad: In a medium bowl, combine lobster meat, scallions, celery, and mayonnaise. Season with salt and pepper. Add parsley and gently combine. Melt the butter in a skillet. Coat both sides of the rolls in the melted butter. Lightly brown one side of the buttered bun, about 2 minutes. Turn and lightly brown the other side. Pat the sides with a paper towel to absorb any extra butter. 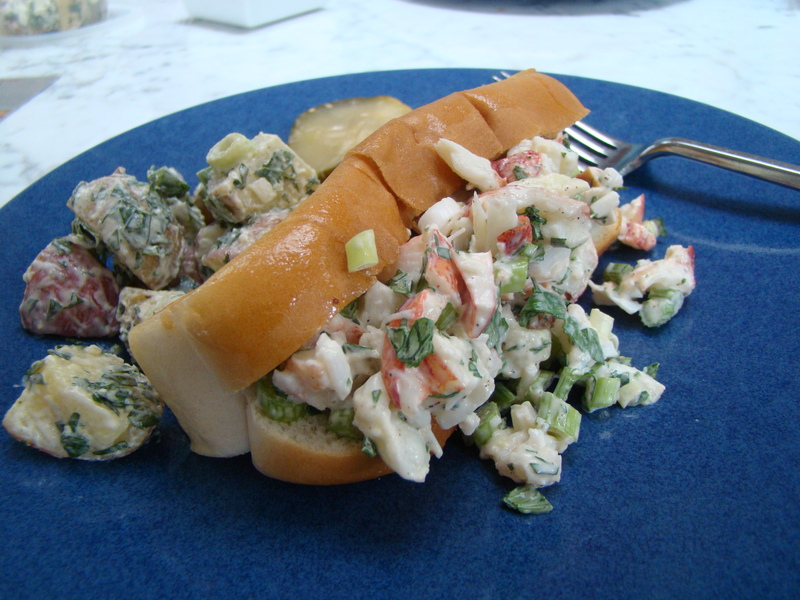 Divide the lobster salad between the two buns. Serve with potato chips or potato salad. Smile and enjoy!